Base price: $24. Currently $12 on Kickstarter. Full disclosure: A preview copy of The Seals of Cthulhu was provided by Thing 12 Games. Some art, gameplay, or other aspects of the game may change between this preview and the fulfillment of the Kickstarter, should it fund, as this is a preview of a currently unreleased game. 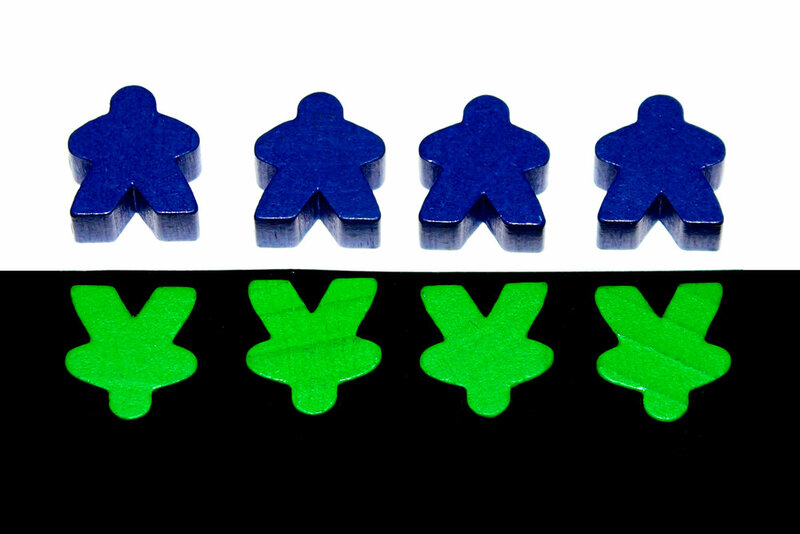 Another busy week in Kickstarter! 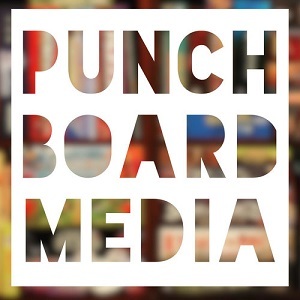 I promise, I have some games that aren’t on Kickstarter and their reviews are coming. Should have a few coming up next week and then intermittently in June. That’s always exciting. Anyways, lest we get ahead of ourselves, let’s turn our attention to another Kickstarter game, The Seals of Cthulhu. In The Seals of Cthulhu, you have a choice — do you play as the Cultist, trying to set free the Elder Gods and wreak literally unspeakable havoc on the world? Or are you the brave Investigator, trying to stop the Cultists before they get too far with their nefarious plots? You’ll both have some artifacts that will prove helpful in your quest, but only if you’re willing to make some sacrifices to get the pieces together. Can you save / destroy the world in time? If you choose to swap an Elder God in, replace Shoggoth with the Elder God and give a copy to both players. No matter what, all players should only have 6 cards. Once you’ve done that, you’re ready to start! The Cultist goes first. Take the bid. They may take the influence markers and you get to keep the card. Flip the card face-up and place it in front of you. Outbid you. They may place any number of influence markers down such that their bid is at least 1 more than yours. Then it’s your turn to decide. If you outbid them, they get a chance to respond, and so on and so forth until one player accepts the bid (either because they want to or they cannot outbid their opponent). 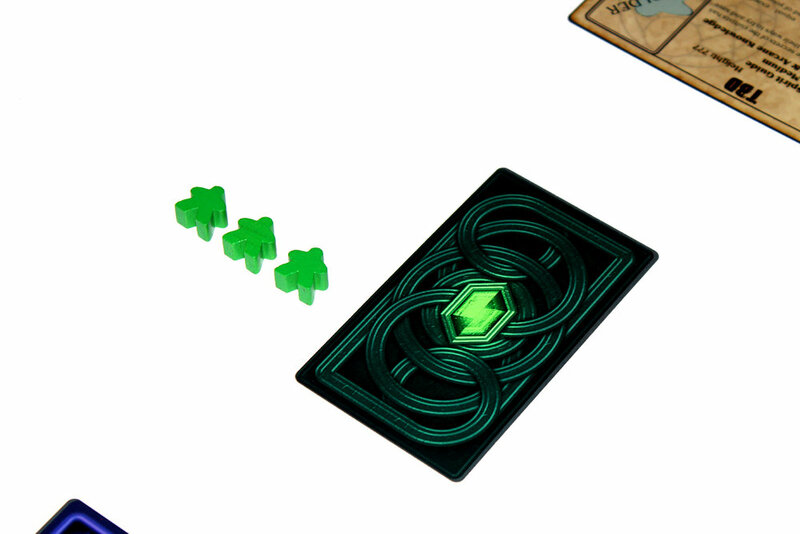 Note that the cards have a Control Value (end-game points) and also an Influence Value. This means that face-up cards that you’ve taken in previous rounds may be used to increase your bid on future cards. That’s pretty fun. However, that’s not the only thing that face-up cards can be used for. 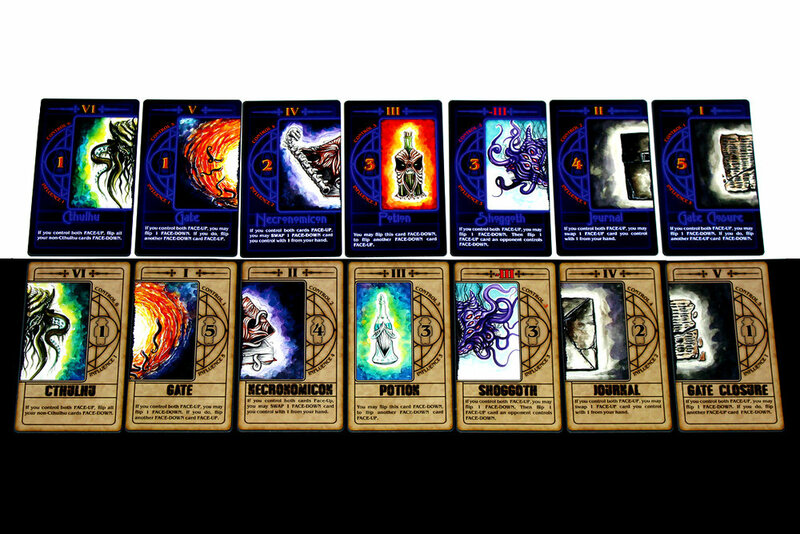 You’ll notice that the cards are all (with the exception of Potions) individual halves. If you were to put them together, well, they’d become something else, entirely. They would become an Artifact. If you control an Artifact, then on your turn (either before, during, or after bidding), you may use its ability once. Once you use it, you’ll likely “break” the Artifact by turning one of its halves face-down. If you were to somehow re-form it (likely by using another card), you could use its ability again. Whether or not you want to combo that is up to you. Anyways, play continues until both players have played 5 cards. The remaining card in their hands is set aside (unless otherwise stated). The player with the most Control Points wins! Two player only, so, uh, N/A. Shoggoth is pretty handy, even though it’s worth negative points. Your opponent definitely doesn’t want you to complete it, but do they want that enough to try to take the negative points themselves? Then they’re just cancelling out your negative, which isn’t much better. Cthulhu is worth losing everything else. That’s 12 points if you can get both of them. If you have an Investigator, don’t forget to use their ability (or attempt to negate your opponent’s). If your opponent scores for taking your Influence Markers, … don’t give them any. Focus on taking theirs and using cards to provide the Influence you need. Or, at least, do so to a certain point. You don’t want to give them a ton of points that way, either. In the same vein, if you have the card that lets you win instantly if you have 13 control, do whatever you can to get it! If you win, you win. You’re gonna need to bluff your opponent. If you can trick them into overpaying for a not-great card, that’s awesome! If you can trick them into giving you a great card for cheap, also good! Also, count cards. 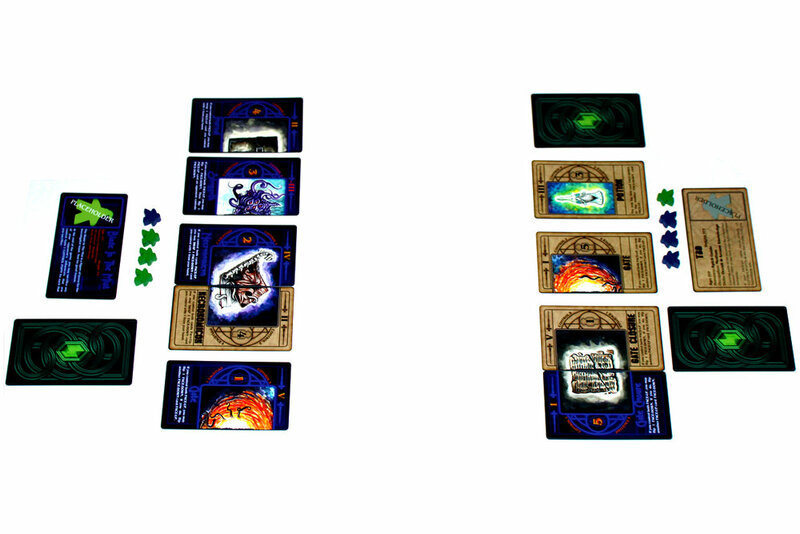 Towards the end of the game, there are only so many cards that they can have in their hand. You should know exactly what those cards are and have a plan for them. Do not let your opponent complete an Artifact. They’re super powerful if they’re used correctly, so, keep them split, if you can. Don’t forget that reforming an Artifact lets you use it again. If you use Shoggoth to flip down your opponent’s 5-point card (a good move, btw) and then use a Potion to refresh Shoggoth, you can flip down another one of your opponent’s cards, all on the same turn! If you hit another 5-point card, you just cost them 10 points, which is pretty intense. You’re definitely not going to make friends that way, but you might win the game. Remember that you can only use Artifacts on your turn. Don’t try to do an endgame flourish only to realize that the game doesn’t end on your turn. Just do it before. Keep track of how much Influence your opponent has. If you know you have more than them, you can use that as effective leverage to take pretty much any card you want. Or, at the very least, one card you want, in particular, which might be helpful. Very inclusive (in spite of the origin of the Cthulhu mythos). They’ve done a good job including a variety of characters, here — you won’t be disappointed. The art isn’t final on my copy, but I’ve gotten to see the final art and it’s pretty cool, especially on the characters. If you’re a fan of the mythos but you’re looking for a more inclusive, modernized take on it, they’ve definitely done a good job incorporating that into the game and I really appreciate that. The art’s nice. It’s dark and broody and colorful and it’s fun to look at. Nice work, honestly. I especially like the box art. Plays quickly. The box size is a bit deceptive in that regard, as it’s really closer to a Favor-esque microgame but the box is the same size as a sorta-mid-length game. Oh well. The symmetry of the roles makes the game simple to learn. That’s always helpful. Asymmetrical games are super fun, but you’re essentially teaching two different games, which is really complicated. Each player having two halves of an entire card is a super neat concept. I really think there are a lot of things you can do with that that would be kind of interesting (imagine it for a deckbuilder, though I suppose Dominion: Empires already does something vaguely similar with the split pile cards, among other expansions). I hope they make more games with this concept as a primary conceit. I’d love to try them. The larger sized cards are nice, but the cards (and the larger box) hurt portability, somewhat. If they were smaller, you could essentially fit the whole game into a wallet game and push it that way, highlighting how easy it is to play it on the go. Button Shy’s got that going for them and I think it helps set a clear expectation of the depth and intensity of the game. With larger cards (and a larger box), that line becomes a bit muddier and I think people can occasionally get the wrong idea. Not really anyone’s fault, just the danger you can run into with microgames. I think packaging for microgames is super important, so I’ve been trying to think about it, more. It often feels to me like the game ends just as it gets going. I’m really interested in getting a full set of a card, and just as I do, it’s the last turn and we’re done. That usually bums me out a bit. Almost makes me wish the powers were a bit less useful and the game were a bit longer so I’d get a lengthier opportunity to run with them. I’d love to see a follow-up game that uses this system, sort of like Custom Heroes and Mystic Vale both sharing the Card Crafting System. You really need to be into bluffing for this to be the game for you. If you enjoy bluffing at like, a Coup level (where most of the game is the metagame experience of trying to read your opponent and outbluff them), then you’ll probably like this one, since you’ll likely have very little idea what your opponent is playing for the first few turns (and, well, that’s about half of the game, by that point). If you aren’t a huge fan of bluffing, Favor, the auction game from The Lady and the Tiger, might be more your speed. Overall, The Seals of Cthulhu is fine for me. As with most short, quick games, I like the portability and the ease of play, but like Wonderland I feel as though there’s a slight bit to the gameplay that I just don’t really get. Maybe it’s that I’m not the biggest fan of bidding games (which is true; I’m not). Maybe it’s that I don’t particularly care for the Cthulhu mythos (also true; I don’t, though I appreciate how inclusive the game strives to be in spite of Lovecraft being a Literal Trash Pile Shaped Into A Person). Perhaps it’s also a bit of my love for two-player games meaning that it inevitably invites comparison to other two-player bluffing games, like Cake Duel, that I remain over the moon for. It could be any number of those things, but I digress. There are some things that the game does pretty well, like each player having two halves of a complete “card” for effects. That’s neat. It creates a good tension when you’re trying to decide whether or not you want to risk your half of the card in order to try and complete the pair. It’s a really neat concept that I haven’t seen before in games, and I’d (as mentioned earlier) love to see that carried forward in future games. That all said, I did have fun playing it; like I said, it’s fast-paced and has some exciting reversals. All in all, if you’re a huge fan of bidding, bluffing, or eldritch abominations from beyond the pale (or any combination of those three), The Seals of Cthulhu might be worth checking out!